Canadian links to ISIS militants in Dhaka highlight the increasing transnationalism of terrorism in Bangladesh. Violent Islamic extremism has been an increasingly visible threat in Bangladesh over the last two years, reaching a critical juncture when the Islamic State of Iraq and Syria (ISIS) claimed responsibility for the Dhaka attack of July 2016. The terror attack on the Holey Artisan Bakery in the capital’s diplomatic quarters, which left 24 non-Muslims and foreign nationals dead after a six-hour hostage situation, was reportedly carried out by local networks affiliated with ISIS. Though it remains unclear whether the perpetrators received material support from the terror group or operated independently, new evidence has emerged confirming that the plan was brought to ISIS for approval and advice prior to being carried out. On December 1, Reuters reported that the Bangladeshi authorities are in possession of communications between the architect of the attack and Abu Terek Mohammad Tajuddin Kausar, an ISIS militant born in Bangladesh but living in Australia. Kausar explicitly approved the attack and advised the five radicals to target non-Muslim foreigners and expatriates. In the wake of a series of killings targeting atheist bloggers, religious minorities, and prominent LGBT activists throughout 2014 and 2015, Bangladesh’s political leaders vehemently denied any ISIS presence in the country. The brutal attacks, often committed with machetes, were downplayed as a string of unrelated and isolated domestic incidents attributed to small, relatively unsophisticated local terrorist groups. However, the coordination of the Dhaka attack, its high death toll, and the confirmation of the Islamic States’ role in its planning all indicate a concerning new development in the country’s terrorist activity. A second connection to Canada surfaced upon the identification of Mohammad Zahidul Islam, killed by Bangladeshi special operation forces in a shootout in September 2016. Islam was allegedly the military commander of the ISIS faction in Bangladesh, responsible for providing arms training to new recruits. The Canadian Department of National Defense recently launched an investigation to determine whether Islam, a former major in the Bangladeshi army, was trained by the Canadian Armed Forces as part of an international military cooperation program for six months in 2014. Only 35 members of the Bangladeshi Armed Forces have been trained in Canada over the last decade. The potential role of a third Canadian in the attack was hotly debated. Tahmid Hasib Khan, a Canadian citizen and University of Toronto student, was initially believed to be a hostage in the Dhaka café but was subsequently detained by Bangladeshi authorities. He was arrested after video footage filmed by witnesses and militants within the bakery emerged, depicting Khan holding a gun and smoking cigarettes with the militants. Police later said forensic analysts determined that the student had been forced to hold the weapon. The nature of his involvement in the attack remained murky at the time of his detainment in August, when he was charged only with “a lack of cooperation with the policing authority.” In October 2016, investigators from the Bangladeshi counterterrorism unit released a statement clearing Khan of any links to the attack and a Dhaka court acquitted him of terrorism. The eighth largest country in the world with 168 million people, Bangladesh was ranked 22nd on the 2016 Global Terrorism Index, between South Sudan and China. Last year the country was ranked 25th, while this year it was included in a group of countries that saw “dramatic increases” in number of deaths from terrorism. According to the report, which does not include the Dhaka attack, Bangladesh recorded 459 attacks and 75 deaths as a result of terrorist activity in 2015, accounting for 4 percent of the global total. 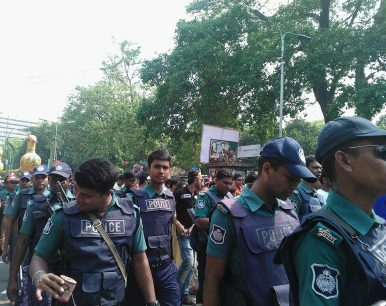 In response to growing national concerns regarding terrorism in the country, Bangladeshi authorities unleashed a widescale anti-terrorism crackdown. By early October, authorities claimed to have killed 42 militants and detained hundreds of suspects, according to an internal police report. Authorities have cited new information regarding the financing of the attack as evidence of their success in combating the rise of Islamic terrorism within Bangladesh’s borders. Only a handful of those arrested, however, have been militants or extremists. Further, of those militants arrested, all were reportedly low-level local extremists without any discernible ties to international terrorist organizations or command-level power within domestic terror structures. The counterterrorism model Bangladeshi authorities are operating may be casting a wide net, but is failing to identify and apprehend key transnational terror culprits at the command level. In fact, authorities initialized a massive extremism crackdown in June 2016, the month prior to the Dhaka attack, and arrested more than 14,000 people. Yet the terrorists responsible for the deaths in the Holy Artisanal Bakery remained undetected by the operation, and the detainments do not appear to have uncovered any substantive information or yielded any significant results. The majority of those arrested are believed to be petty criminals with no links to domestic or international terrorism. The numerous links to Canada exposed by the Dhaka attack emphasizes the transnationalism of modern terrorism. As evidenced by the exclusively electronic communications between Kausar and Chowdhury, prominent terror networks are increasingly dependent on sophisticated technological strategies to plan and execute attacks, radicalize and train new recruits, and disseminate propaganda materials. To identify upper level actors in modern terrorist networks like ISIS, it is essential that Bangladesh update its counterterrorism approach to focus on global, cross-border terror mechanisms and strategies rather than focusing on a rapidly disappearing “on the ground” domestic model of terrorism confined to local areas and actors. To prevent terror being cultivated abroad and exported into the country, as has evidently been a facet of Canadian radicalization, Bangladesh should develop its counterterrorism strategies to focus on partnership and cooperation with foreign governments and technologically advanced methods of analyzing military records, flight and travel information to “hot zones” and conflict areas in particular, social media data, and other metrics that may have a stronger capacity to anticipate and prevent attacks. Developing joint partnerships with foreign governments to target the growth of cross-border terrorism is critical to successfully mitigating the threat of extremist activity in Bangladesh. Politicizing the Dhaka attack as a product of local opposition forces ignores the global reality of modern terror networks and hampers the effectiveness of counterterrorism efforts in the country. Bangladesh’s leaders must first acknowledge the reality of the threat, and subsequently work to develop counterterrorism policies suited to the transnational nature of young, modern terrorist networks like the Islamic State. Kerry’s visit to Dhaka shows how seriously the U.S. takes terrorism in Bangladesh.